Our son Ben is an idea man, like his father. He gets something into his head and he relentlessly pokes and prods until we provide the tools he needs to make the idea come to life. 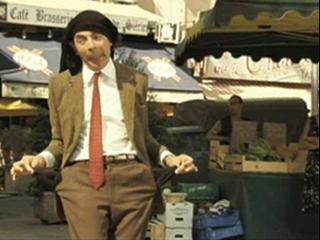 After having watched Mr. Bean's Holiday and the scene where Bean busks for change lipsynching an aria, and in anticipation of the interPLAY Festival, he had nurtured an idea to do the same at this year's event. Of course, I had no clue that this notion was percolating inside his mind until he quickly ran out of money on the Friday of the 20th anniversary of interPLAY. "Papa, I need my guitar and a hat," he said. "I want to busk and make some money," he said. OK, I thought myself, trying to negotiate between the fact that he doesn't know how to play the guitar and his eagerness to give it a try. Eventually, I shrugged and drove home for the guitar, thinking what harm could it do. I came back with his little guitar, shy a couple of strings, and an old straw hat to collect tips. He set himself up on a stack of wooden palettes near Heather's marketplace booth and began plucking at his strings and thumping his guitar. I tossed in a loonie or two to get him started, concerned that his little heart might get broken. My concern was completely unnecessary. In just over an hour he had earned over $40. On the second day, through several hours of strumming and thumping he gathered well over $60. Today, he added another $50 to the kitty. At one point, in the heat of mid-afternoon on Saturday, a real guitar player settled in and joined him in entertaining the passers by. I didn't catch the fellow's name, but he was great and even treated Ben to a drink halfway through their "set". He's either going to grow into an amazing artist, or a cunning businessman. Either way, I was proud of his initiative and gumption.